“You can talk to God and listen to the casual reply.” Woops, that’s Rocky Mountain High. I suppose you’re looking for Kava Kava High. Sorry to disappoint you but the Kava Kava High is not like the high from hard drugs. (Not that I’ve tried any hard drugs.) But I have tried kava. 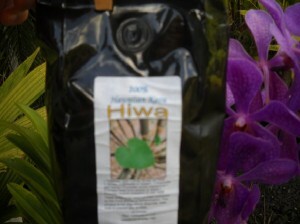 In fact, here’s a picture of my current bag of kava. It is Hiwa Kava from the folks at Hawaiia Kava Center. According to them, it was the favorite variety of kava (or awa as we say in Hawaii) of the Kahuna. Now the Kahuna were the high priests and advisors of Hawaiian royalty. They were really smart and also really scary dudes, who were not to be messed with. And they liked this variety of kava the best. Why did they like it so much? Well it produces amazing cerebral effects. It generates a sublime state of calmness and focus like no other. I feel like my mind can go places that it normally can’t. It relaxes my muscles and my whole body. It makes my lips and tongue a little numb and it produces a mild euphoria. It seems to lower my overall levels of stress and anxiety. It is totally unlike the effects of alcohol. When I drink it, my mind stays completely sharp and I don’t experience any hangover like effects the next day. A word of warning. Don’t buy this if you have sensitive taste buds. I buy it and I drink it because I like the effects, but I hate the taste. In my opinion it is the worst tasting of the Hawaiian Drinks.Some people say its taste has hints of cocoa, but I think it tastes like dirt mixed with leaves and a dash of pepper. But that might just be me.